EA has just released a new video interview with Titanfall’s producer Drew McCoy that took place at Gamescom. He described how the idea for Titans started out as a 14″ model or statue that was originally intended to be human exo-skeleton or suit. It wasn’t until a 3″ figure was placed next to it that the idea for Titanfall was born. Matt Littler and Darren Jeffries are in Cologne for gamescom 2013 to chat with producer Drew McCoy about the ideas behind Titanfall. The small team at Respawn Entertainment have set out with high standards for their first title, with the concept focused around giant mech-walkers named ‘Titans’. 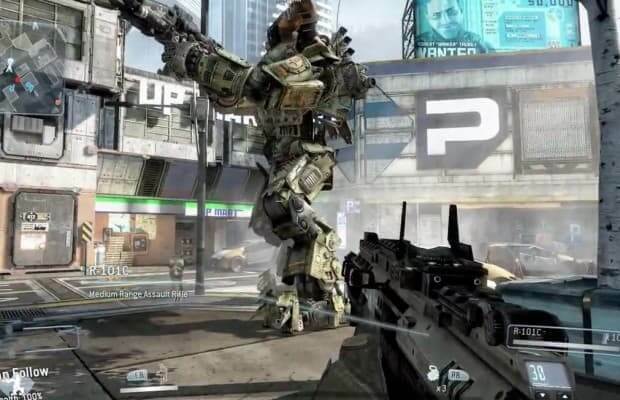 The Titans have been designed using motion capture to provide a sense of fluency and power when operating them, demonstrated in their ability to lift up and place the player in the cockpit or tear enemies out of their Titan. Titanfall is a multiplayer experience with single player elements that occur around the players. Levels are introduced with a narrative and events occur during the online gameplay which add to the overall story. Even the ending features a bonus epilogue round in which the winning team try to hunt down the retreating losers before they can escape to their dropship.